A quick way to date older postcards is to look at the back and see if there’s a postmark. But while you’re there, check if the back is divided. Originally, postcards had to have the address on one side and the picture (and message on the other). The UK was the first country to change this, in 1902, and postcards were printed with divided backs. One side for the address and one side for message (but only for domestic postage). Early divided back postcard. 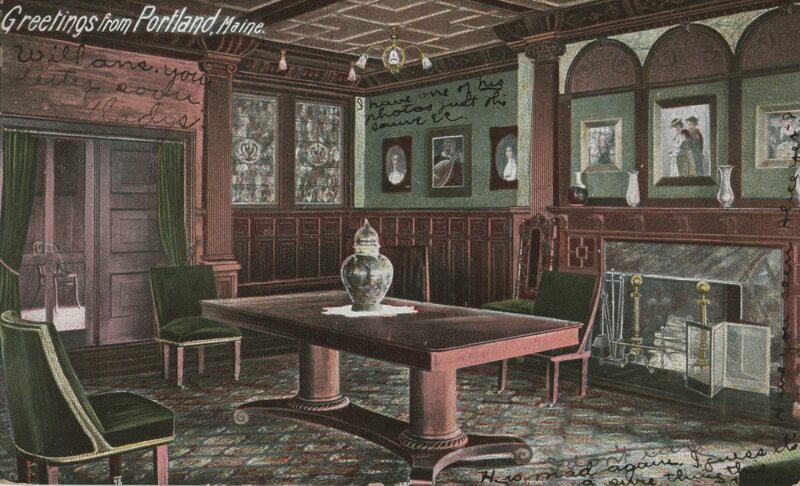 Postmarked 1905. In the USA, the change occurred in 1907. “This Side for the Address Only”. Postmarked 1906. Chrysanthemum Display, Horticultural Hall, Philadelphia, PA.
Not all undivided backs had a border. Sometimes the message had to be written across the image. Red Room, Riverton Casino. | Greetings from Portland, Maine. This sender made use of empty areas in the picture.